When you need to collaborate with people outside of your organization, you can add them as guests to your team workspace. Only workspace administrators can invite guests to a workspace. 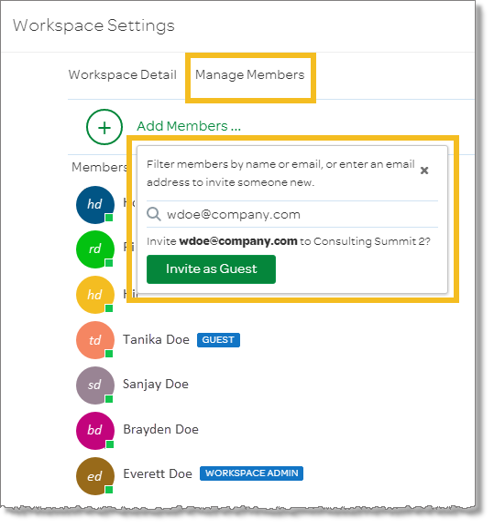 To invite a guest, use the Members tab or the Workspace Settings window. At the upper-right of the workspace, click the More Actions icon , and then select Members. Enter the email address of the guest you want to invite. 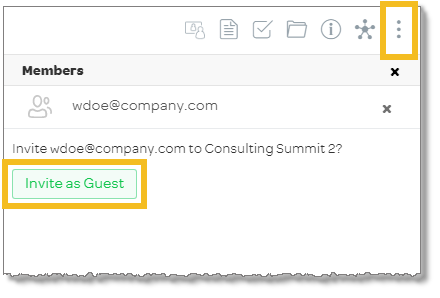 When the button appears, click Invite as Guest. At the upper-right of the workspace, click the More Actions icon , and then select Workspace Settings. Click the Manage Members tab.